Visual art in public spaces can be big or small. It can loom overhead, forcing you to squint into the sun to see it, or it can scream for attention from beneath your feet on the pavement. There are no rules about how it must look, what medium it should use, or what shape it should take. What it must do is play with expectation, heighten awareness, spark debate, shift the way you think, celebrate imagination, and make art accessible to everyone. 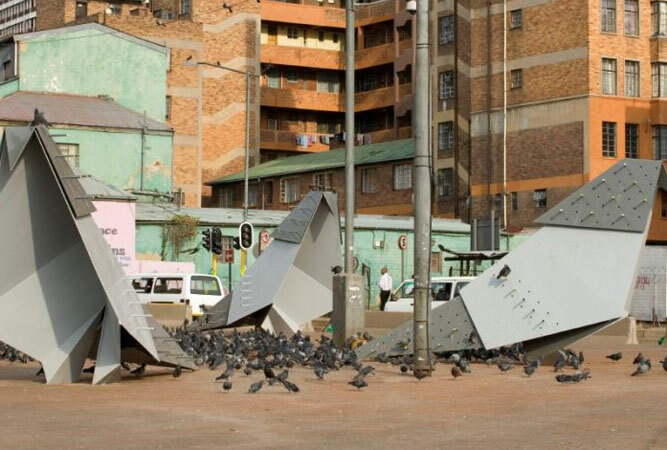 In Johannesburg much of the city’s public art is concentrated in the Newtown Cultural Precinct. But Newtown’s visual and public art scene is not limited to commissioned sculptures and art works. It also includes a vibrant street art scene (an umbrella term used for all visual art in public locations, by artists who choose the streets as their gallery). Johannesburg’s aim is to be the largest street art city in the world by 2040, and a fair amount of money goes towards it. The white concrete angel set on a column opposite Constitution Hill with its arms widespread, a little like Christ the Redeemer overlooking Rio de Janiero, is a welcoming sentinel figure to the no-go suburb of Hillbrow. Created by Usha Seejarim the work is a tribute to Gandhi’s satyagraha or ‘the force which is born of truth and love; non-violence’. The cast iron pot, above which is a zoetrope that when spun reads ‘peace’, reflects the cauldron and bonfire that marked the first burning of the Indian passes during his campaign of passive resistance. This eleven-metre tall steel sculpture stands on a traffic island on the Newtown side of the Queen Elizabeth bridge; a silhouette of a woman walking with a fire brazier atop her head – not an uncommon sight in the city where women cook and sell corn on the cob to city commuters. Erecting the sculpture from a smaller scale model made of cardboard was something of an engineering feat. This permanent slate art work of a man lying inert, his arms by his sides, is the work of Angus Taylor, made in the Roman practice of stacking stones in a pile on crossroads outside towns as homage to the god Hermes (god of weight and measure, boundaries, travels and bringer of dreams). 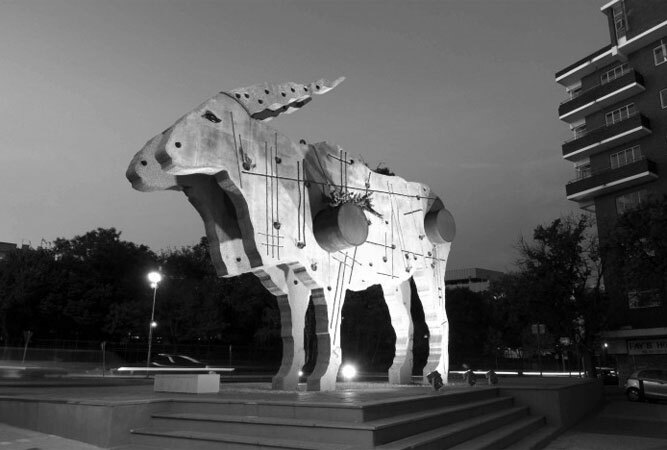 The sculpture is an edition of four, the others are in the Karoo, Belgium and Canada. An avenue of 25 steel trees line Juta Street, both east and west of the Nelson Mandela Bridge. The project, conceived by the Imbali Visual Literacy Project and built by Claire Regnard, began with 9 original trees in 2006, and a further 16 in phase 2. More recently they have had a colour revamp – now bright turquoise, pink, red, purple and green. ROA is one of the world’s most famous nomadic muralists. Belgian by birth, he travels the world painting mostly animals indigenous to the land he visits, within the concrete landscape of man. It serves as a sharp reminder of of the beauty of nature within the environment of concrete. 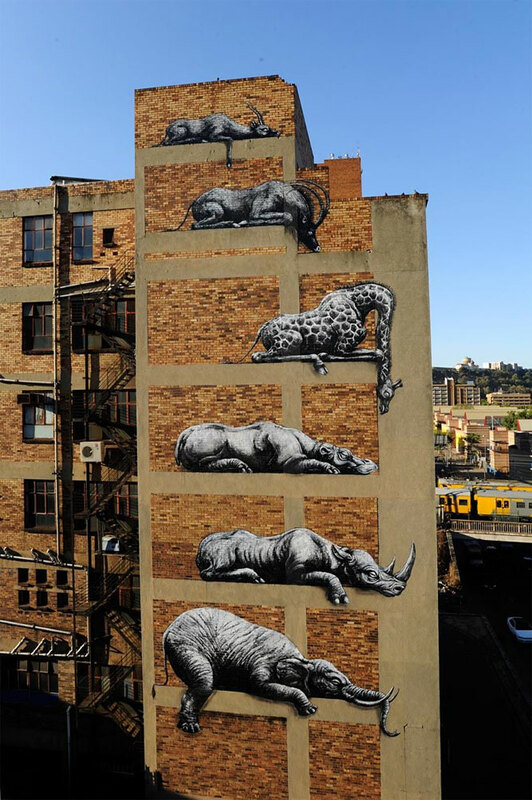 Find these six massive African animals (the giraffe, hippo, elephant, rhino, springbuck and sable antelope) stacked on top of one another on a building façade in the trendy Maboneng Precinct (an area that lies inbetween the CBD and Jeppestown, on the east side of Johannesburg city), visible from the road. The murals were painted for I Art Jo’burg in 2012. Set at the gateway to Braamfontein, Clive van den Berg’s sculpture of a giant eland is planted with evergreen plants, as it explores the relationship we have with land, our need to find ways to share it, to use its resources sensibly, and the cultural meaning of the eland, set on a corner from where it has long since disappeared. Located in the Pieter Roos Park, on the corner of Empire and Victoria roads, this work by the same sculptor who recently unveiled the famous Capture Site sculpture of Nelson Mandela, depicts a figure with outstretched radial arms, greeting visitors to Yeoville. When graffiti looks like that on display under the highway on Henry Nxumalo Street, why would you want a gray building? This spot serves as an unofficial graffiti gallery of the city. Head to the back of the cul-de-sac and look out especially for the works of Tapz and Finn. Anything by Falko One, one of the country’s best known graffiti artists, is also worth seeing. The artist (it’s about a man that can paint pretty pictures with a spray can (and a ladder)) was behind the first graffiti competition in South Africa. His compelling work is on the forefront of the movement to accept graffiti as a credible art form. His work, and that of his contemporaries, changes the concept of street art as a form of vandalism, to that of art. To see the art in Newtown in particular, take the Newtown Heritage Trail. It comes with its own maps, numbered attractions and information boards.